Among recent enlistees in the Union Army is 71-year-old Dr. David Tschudy of Hagerstown, who leaves behind a young wife and two small children. 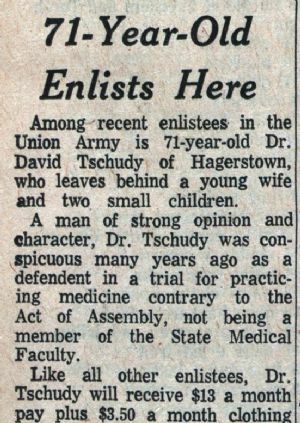 A man of strong opinion and character, Dr. Tschudy was conspicuous many years ago as a defendent in a trial for practicing medicine contrary to the Act of Assembly, not being a member of the State Medical Faculty. Like all other enlistees, Dr. Tschudy will receive $13 a month pay plus $3.50 a month clothing allowance. He will also receive $100 bounty, and a tract of bounty land. Ex-governor Francis Thomas established his headquarters for the Potomac Home Brigade at the Fair Grounds on Oct. 1, and Charles Welsh, Martinsburg, P. aj. Mayberry, Hagerstown, and T. H. Irvin, Boonsboro, opened recruiting offices there at the same time to strengthen Thomas’ command. There was some sharp firing across the Potomac at Dam No. 4 on Friday last between Capt. Karnes’ men on this side and a band of rebel troops on the other. It is conjectured that the rebels intended to cross over to procure salt from warehouses along the lines of the Canal, but they were repulsed by Karnes’ men, one of whom is reported to have been severely wounded in the shoulder.